New, acronym-intensive sports statistics come out all the time, each claiming to be more incisive than the last: WHIP, OBPS, xFIP, PER, just to name a few. A team of Harvard statisticians has recently devised a new way of getting at what they believe is the true on-court value of a professional basketball player. It’s called Expected Possession Value, or, EPV. It evaluates how each small decision a basketball player makes in the course of a possession affects his team’s likelihood of scoring. Traditional NBA statistics, like points, rebounds, and assists, measure what the research team calls “terminal states”—the end results of a possession. You can learn more, though, they argue, by looking at how each decision players make along the way to, say, a made three-pointer from the corner, contributes to the likelihood of that final outcome occurring. Enter EPV, which was presented last weekend at the MIT Sloan Sports Analytics Conference and reported today in the Harvard Gazette. That statistic is made possible by a data boom in the NBA. During the 2012-2013 season, the NBA installed a system of motion-tracking cameras called SportVU in 13 arenas that recorded the position of the ball and all 10 players on the court 25 times per second. The result was an incredibly rich dataset that allowed the Harvard statisticians to weight the different options available to a player when he had the ball—and to evaluate which players were best at choosing the option that maximized their teams’ chances of scoring. You can see how EPV works in this diagram, from the researchers’ paper, based on a game where the San Antonio Spurs played the Oklahoma City Thunder. Spurs guard Kawhi Leonard has the ball at the top of the three-point line. He can shoot, drive to the hoop, or pass to any of his four teammates. 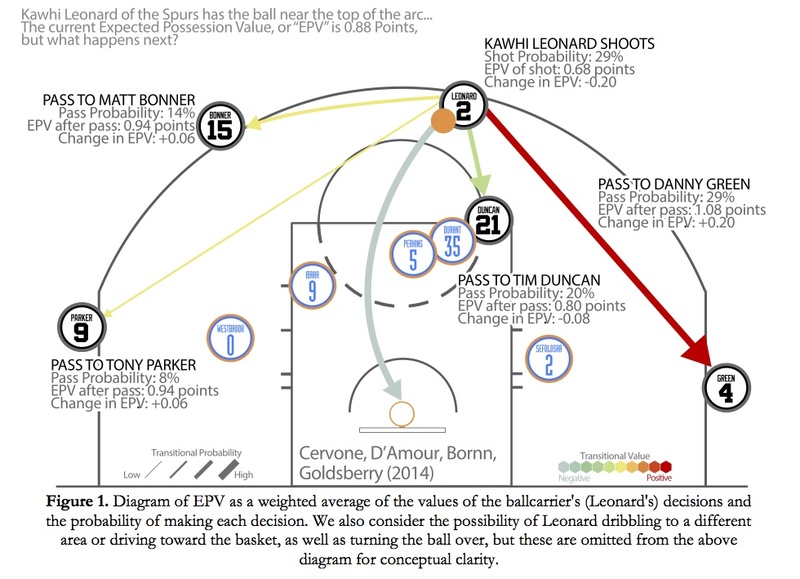 The best choice, indicated by the thick red arrow, is a pass to sharpshooter Danny Green in the corner, and if Leonard chooses it, his personal EPV improves (because he made the “right” decision) regardless of whether Green takes or makes the shot. A major appeal of EPV is that it has the potential to provide real-time analysis of how a possession is proceeding. You could imagine a little graph at the bottom of your television screen showing the expected value of a team’s possession and fluctuating continuously as the action unfolds. It would be like a stock ticker, or those graphs produced during presidential debates, where focus group participants turn a dial to indicate how much they like what they’re hearing from the candidates. Of course, any statistic has to pass the reality test—and the more it produces results that diverge from what we know from experience to be true, the more skepticism we should apply to it. And here, EPV has some work to do. The researchers created a statistic they call EPV-Added (EPVA), that compares players based on the sum of all the decisions they make in the course of a season. The researchers ranked the ten best and worst NBA players by EPVA for the 2012-2013 season. There are no Celtics on the list because Boston is one of a small number of teams that doesn’t release its SportsVU data to researchers. The number one player by EPVA was Los Angeles Clippers All-Star guard Chris Paul, a choice which definitely passes the sniff test. The player with the second worst EPV, however, was more questionable: center Kevin Love of the Minnesota Timberwolves, who’s a leading contender to win the MVP award this year.